Reservations beginning before July 1 are exempt from the Lodging Tax! Book an early getaway now! Escape year-round to this charming bungalow for a well-deserved break. Lovingly refurbished to reflect a marine sanctuary, it’s perfect for a family vacation or solitary retreat. Custom-built in the 1930’s by Brad Norris for his wife’s “summer business”. The large front deck has a dining table, chairs and gas grill. Upon entering the living room, there is a comfortable couch which opens to a full bed. There are two sturdy reading chairs, a work table for computers and puzzles, a flat screen TV and DVD player. 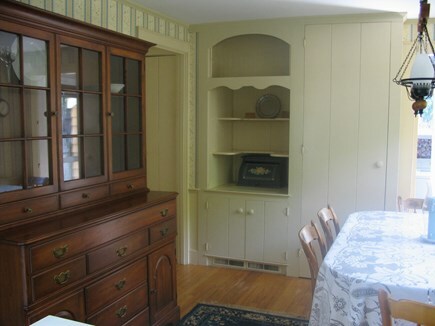 Hardwood floors run throughout with fine woodwork accent moldings. The Mitsubishi air conditioning unit cools the whole house. There are 2 bedrooms, 1 full bath, a living room, dining room and full kitchen. The front bedroom has a king bed with shelved head board. The bureau and closet are great storage for clothing. 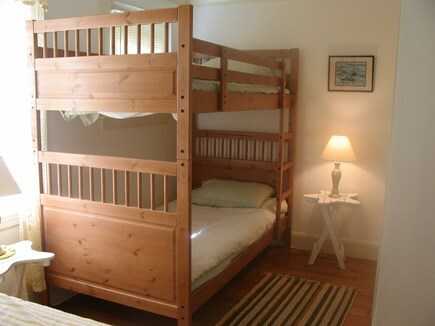 The second bedroom has a full bed, set of bunk beds, bureau and roomy closet. 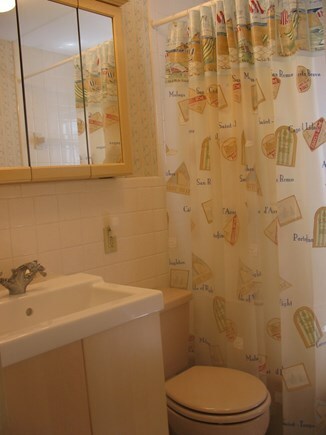 The hall closet contains the bath and beach towels. The full bathroom is across the hall. 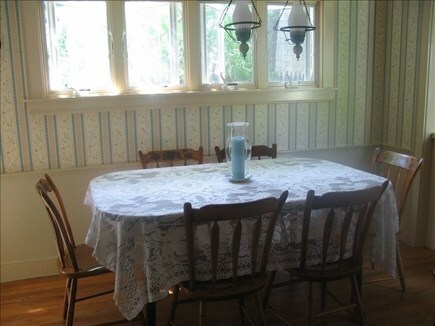 The dining room has a Hitchcock dining table for family meals and sideboard. There are games for all ages in the cupboard under the kitchen counter. 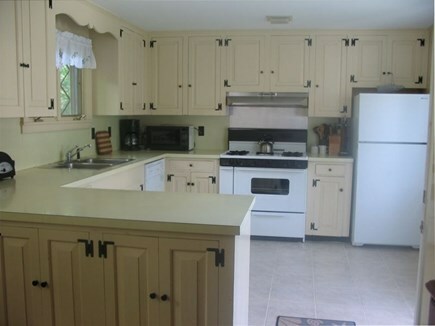 The kitchen is fully equipped with all appliances; toaster oven, microwave, coffee maker, teapot, gas stove/oven, and refrigerator. All utensils, dishes, cups/mugs, glasses/wine glasses, blender, pots, pans, bowls, casseroles, cutting boards, and grill tools are provided. 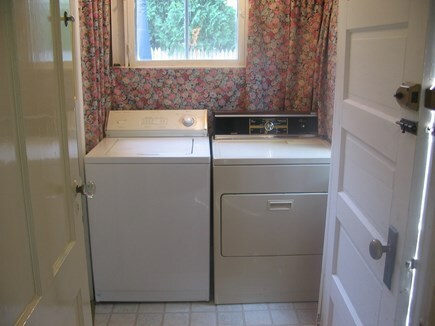 The laundry room is in the back hallway at the back entrance. 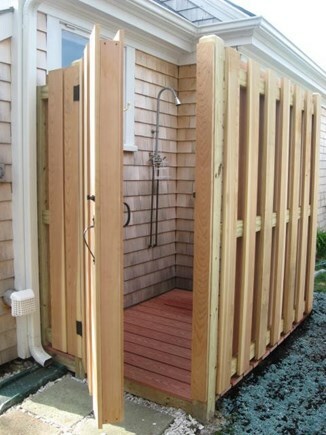 The outdoor shower is out the back to the left near the shed and is a Cape Cod necessity for rinsing off beach sand and ''natural' showers. 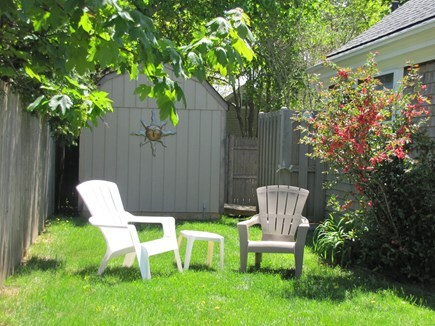 The beach chairs are in the shed for guest use. Rubbish and Recycle bins are at the back shelled area. Quaint and comfortable, you will find all the amenities of home with the simple things of life at your fingertips and footsteps. Pull into our oyster-shelled driveway, unpack, and take a walk up to the Hyannis Port Golf Club for the spectacular sunset over Squaw Island. Walk to Sea Street Market for sundries, groceries, and newspapers. 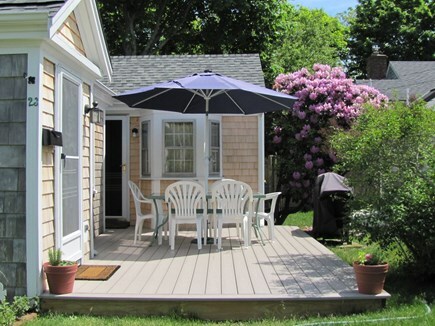 We are a 3-minute walk to serene Sea Street Beach with picnic area, Bath House and Snack Bar. We’ve watched osprey dive for minnows there at low tide! 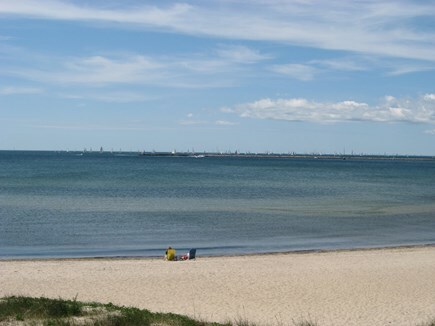 The popular beaches: Veteran’s, Kalmus, (ideal winds for the best sail boarding in New England), and Craigville, are short hops away. Main Street restaurants feature casual and fine dining with daily catches from local fishing vessels. Visit the Hyannis Harbor Docks to see fish and lobsters being off-loaded, while you shop at the local artisan kiosks. Popular restaurants dot Ocean Street and offer a view of Hyannis Harbor. Nightlife abounds and cinemas feature box office greats. Enjoy summer theater performances at The Cape Playhouse and unique foreign films shown at The Cape Cod Art Museum. Farm-fresh food is available through “Edible Cape Cod” farm members and Farmer’s Markets. Agri-Tourism farms bring back times past with “Pick Your Own” options, tours, hikes, hayrides and workshops. The local wineries host tastings to showcase specialty wines. 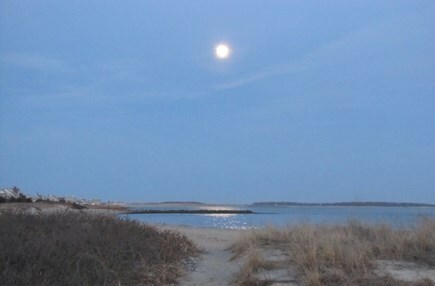 Treat yourself to a quiet home base from which to explore the whole Cape, including the Massachusetts Cultural Coast. Be really “Green”, bring your bikes and ride the bike trails for miles through The Cape Cod National Seashore and beyond. 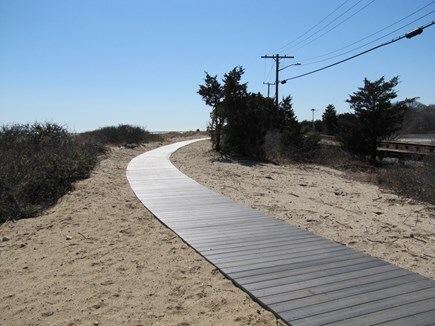 ''Cape Cod Rails to Trails'' will give you a great workout with views of cranberry bogs, marshes, and ocean panoramas. Go fishing for trout, smallmouth bass, chain pickerel and bluegill at one of the 365 kettle hole ponds, or surf cast off Dennis Beach. Private and public golf courses are minutes away and across town, historic Route 6A will pique your architectural and antique sweet tooth. 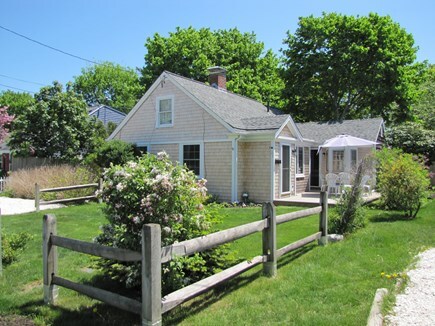 We are 45 minutes from historical Provincetown, where you can experience the sand dunes, sunset horseback rides, and shop for unique art and entertainment. Whether this is your summer vacation or a spur of the moment getaway during the winter, leave your cares at home. Come read, write a book, finish a project, sketch, or photograph the beauty of the ocean and its environs. Off-season, short stays for weddings, conferences, and business are also available. 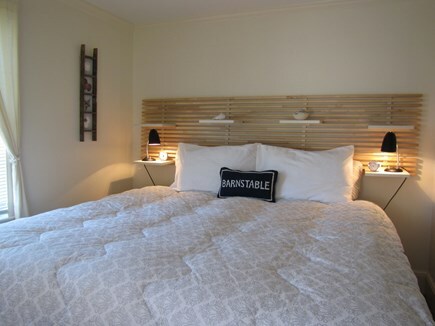 Additional pricing info: Cleaning and linen are included, State and local taxes of 14.45% will apply. 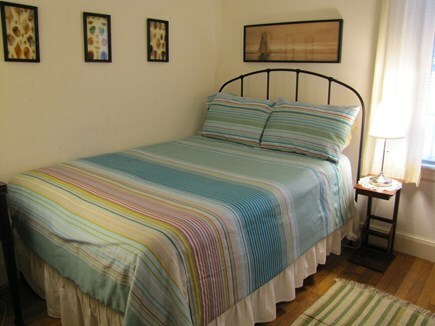 All rooms and bathroom are located on one floor, so it is easily navigable. The hallway and doorways are standard size and do not accommodate wheelchairs, but walkers will function well in the space.